You are interested in hosting a seminar with one or more SAMICS fighting styles? It is easy. Just contact us and let us know what your needs are! Let us know where you would like to host the seminar, course or workshop and how many participants you expect. Tell us whether they are at the beginner level, advanced students or instructors at your school or gym. Inform us about the aim of the seminar and the envisaged timeframe for holding it. Costs, pricing model, scheduling and seminar format will depend on your local requirements and are available on enquiry. Generally seminars have a “weekend” format – held over two days, 4 hours per day – and basic costs will include up to 30 seminar participants, however larger groups can be accomodated on request. 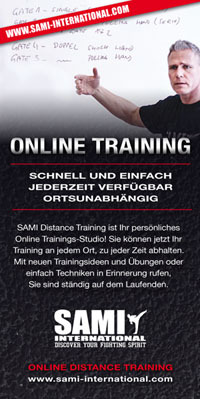 Seminar topics: A full detailed customized sample training schedule and list of topics to be covered in your hosted seminar will be made available to you as soon as you have informed us of your needs – we will require information on which SAMI Combat System, your goals, your target audience – e.g. beginners, advanced students, instructor candidates, instructors. Trainers: International SAMICS Seminars are always held with a minimum of two trainers – a head trainer and a co-trainer – co-trainers are also, without exception, highly qualified instructors in the SAMICS system being trained at the seminar. It should be noted that for very large groups or groups with very varied requirements, and at SAMI International’s discretion, additional co-trainers may be required. Duration: The typical “Weekend Seminar” format is held over 2 days with 4 hours of tuition per day as we have found this to be the most successful learning format for participants. An exact timing schedule for the day however – mornings, afternoons, breaks, lunch etc. may be agreed with the SAMICS Team to fit your needs. Tuition language: All international SAMICS Seminars held by SAMICS are conducted in English. However on special request another second language may be available depending on trainer and co-trainer/assistant. Clothing & Equipment: In general (except for examinations requiring a specific dress-code) participants need only wear their usual training gear. For all SAMICS seminars participants are requested however to bring MMA and/or boxing gloves and mouth-guards. Further, depending on SAMICS system other equipment e.g. training weapons, shin-guards, protective helmets etc. may be advised. Details and guidance on required equipment will depend on the SAMICS system or topic of the hosted seminar. You as host are, of course, in charge of choosing your venue for the SAMICS Seminar. 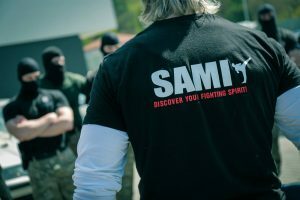 As you are considering hosting a seminar with SAMI International you probably already have a background in martial arts or combat sports and are involved in your own gym, training center or similar so you will have a good understanding of the requirements for a high-quality venue, adequate facilities for participants, and the training equipment necessary. Nevertheless please let us know the location of your venue in your initial enquiry and let us know which facilities we may expect for the SAMICS Seminar – of interest are such details as building (gym, martial arts club, general purpose gymnasium etc. ), flooring, room size and the training equipment at the venue e.g. a sufficient quantity of mitts and pads for all seminar participants should be available. As host for a SAMICS Seminar this is your event, organized locally for your target audience. Registration, Ticket Sales, Marketing and Promotion will naturally be your responsibility. You have the experience and know your clients best, probably even host your own regular courses and seminars. Seminar Registration Support: Once a SAMICS Seminar has been scheduled SAMI international will publicize your hosted seminar as a listing on our sami-international.com Distance Learning and International Seminar platform. (https://sami-international.com). Once listed potential participants will be able to get information, check pricing, see your contact details etc. They will also have the possibility to “Register Now” for the event (registration only, no actual ticket sale or financial transaction) – these registrations will be forwarded automatically to you to process locally. Seminar Collaterals Support: For your promotional material, and on agreement of use and content, we can offer you ready-to-use collaterals in electronic format. Collaterals such as, but not limited to, logos, videos, posters, ads, brochures, SAMICS specific info text-blocks, SAMICS images in various resolutions for both web-based and print literature. Seminar Promotion Support: SAMI International has an international network of over 30 websites and is active on all Social Media platforms. Once your SAMICS Seminar has been scheduled we will include your event in our regular promotional activities, both to the wider SAMI International community to increase awareness of your local brand and, where appropriate and possible, to our followers, partners and friends in a geographical area relevant to your location.